China has been paying close attention to the Rakhine State conflict in Myanmar and the ensuing refugee exodus to Bangladesh. In March, during the legislative two sessions, Foreign Minister Wang Yi said China has always insisted on a peaceful and rightful way of dealing with international affairs, especially those at the center of attention. 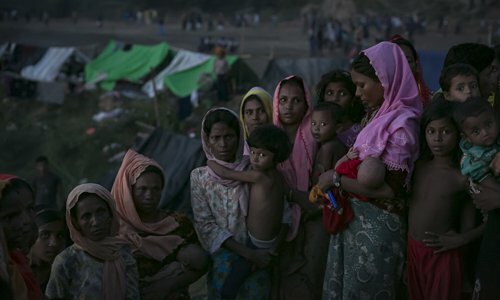 Nearly one million Rohingya refugees have fled Myanmar to neighboring Bangladesh since violence broke out between the Myanmar military and the Rohingyas, becoming a major humanitarian crisis. The international community has since been in a debate about how to accommodate the refugees. China has proposed a solution aimed at tackling what it perceives to be the root cause of the conflict and massive exodus - poverty. Last November, while jointly meeting the press with State Counselor and Foreign Minister Aung San Suu Kyi of Myanmar in Nay Pyi Taw, Wang introduced China's opinions on the situation in Myanmar and noted that China suggested addressing this issue in three phases. For the first phase, an on-site cease-fire should be called for and social stability should be resumed. In the second phase, all parties along with the international community should encourage Myanmar and Bangladesh to strengthen communication so as to find a feasible approach through friendly consultation. At the third phase, priority should be given to addressing the root cause of this conflict. China believes that poverty is the cause of such turbulence. Even though Rakhine State boasts rich resources, its development still lags far behind. 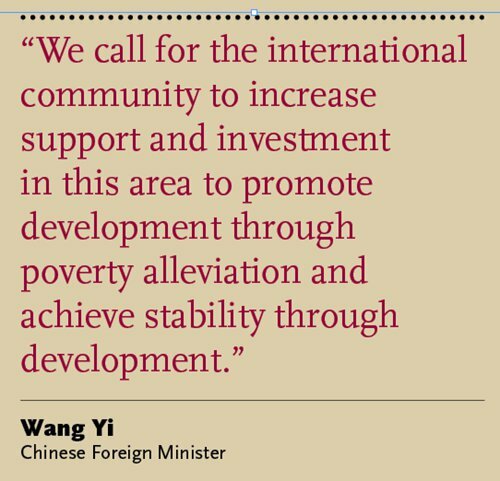 "We call for the international community to increase support and investment in this area to promote development through poverty alleviation and achieve stability through development. China is willing to make contributions to this end and play its due role," Wang noted in a proposal that was highly regarded by both sides. China has long been following step three of this proposal, not only in Rakhine State but also in other parts of Myanmar requiring strong poverty alleviation efforts. Last September, Hong Liang, China's ambassador to Myanmar, donated 200 million Kyat ($150,262) on behalf of the Chinese government to Myanmar's Ministry of Social Welfare, Relief and Resettlement for Rakhine State. Lin Yuan, deputy director of the Myanmar Office of the China Foundation for Poverty Alleviation (CFPA), told the Global Times the organization has been conducting educational projects in Myanmar since 2015 and has received good results. In 2013, CFPA sent a team to assess the needs of Myanmar. The team visited local governmental departments, monasteries, universities, villages, media, an economic counselor to Chinese enterprises and overseas Chinese living and working in the neighboring nation. "We chose education because we thought it is important to a country's development, and also because we have a lot of experience in China regarding education," Lin said. The office found that higher-education quality in Myanmar is not ideal, with many local college students receiving less than satisfactory knowledge and having to take private training classes in their free time in order to obtain jobs in the future. Furthermore, local college campuses do not have dormitories, forcing students to travel great distances to school every day; many families simply cannot afford to send their children to travel to school. To change this situation, CFPA proposed the Paukphaw Scholarship Project, which aims to provide financial aid and capacity building for Myanmar university students in need, who are selected by a committee of officials and teachers. The selected students receive $300 per person per school year (10 months), which is $30 or 30,000 Myanmar Kyat every month. In 2015, CFPA conducted a pilot project to aid 50 students in two universities in Yangon. In 2016, it expanded to four universities in Yangon; last year, the project expanded to Rakhine State, aiding 100 students there. The project now has 1,300 students in total. "Another phase of the project to be implemented would be to contact Chinese companies in Myanmar and ask them to take in local students as interns. This way they are improving their skills and at the same time they can do volunteer work in the community," Lin said. China has also been providing Myanmar with assistance in other areas, such as infrastructure and agriculture. In February, a model project for rural poverty reduction with financial and technical assistance from China was launched in Lewe and Tatkon townships in Nay Pyi Taw. The agreement was signed during Wang Yi's visit last November. China provided 33.33 million yuan ($5.31 million) for the project, which includes social infrastructure development, vocational training, income-generation and capacity-building assistance for residents. Over 7,000 people from 1,400 households in project areas are expected to benefit from the project. China will also send experts there along with financial assistance in order to ensure the success of the project. "We are encouraging them to implement construction of village roads and bridges, construction of an agricultural product quality control center, hybrid paddy seed research and an animal disease laboratory," Chinese Ambassador to Myanmar Hong Liang told the Myanmar Times. In March, China and Myanmar signed a letter implementing China-aid in the new Kunlong Bridge Project in Myanmar's northern Shan State, Xinhua News Agency reported. The bridge, located on Theinni-Kunlong-Chinshwehaw road and crossing the Thanlwin River, extends about 4.2 kilometers in total. The length of the bridge is about 323 meters and linking roads are about 3.9 kilometers. The project is expected to facilitate transportation of Myanmar's agricultural and livestock products to China, thus boosting the development of border trade between the two countries. It would also raise the level of employment and income of local residents and play an important role in maintaining tranquility along border areas. These efforts have been well-received by the Myanmar side. Home visit cases by CFPA revealed that the scholarship program has greatly improved the livelihood of the students. One student, Ma Aye, is an orphan being raised by her grandmother. Because of the scholarship, she can now purchase text books and attend English training courses and computer programming classes, which will help her become more competitive in the local job market. Another student, at Mandalay University, told CFPA she was going to drop out just six months before she received the scholarship. She lives in a single-parent family. After she received the scholarship, she used it to pay for college and buy books that will better prepare her for a job. Rather than this being a purely one-sided aid, exchanges between the two countries can, in the long run, benefit both sides. In March, Myanmar sent officials to Southwest China's Yunnan Province to observe the development of rural communities. Representatives spoke in depth with Chinese villagers to learn about their agricultural production, livestock breeding and sales of products. Last November, Wang Yi also proposed a China-Myanmar economic corridor, which would start from Yunnan and extend to the central Myanmar city of Mandalay, and then east to Yangon and west to the Kyaukpyu Special Economic Zone. The proposal would also serve as a flagship project of the Belt and Road Initiative. For China, such an economic corridor would open up the less-developed southwestern region to overseas markets, contributing to the local economy. Myanmar in particular would greatly benefit from China's proposal in terms of infrastructure and poverty alleviation.